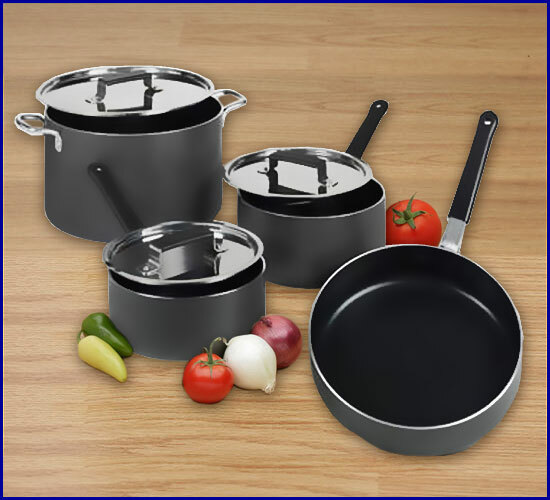 This is the Ameriware Professional commercial grade, American made Seven Piece nonstick cookware set - our most popular set and the best deal you will find on this site. NSF approved. Completely nonstick inside and out.Features the Pro Series Plus Ti-2 nonstick system. This revolutionary new 3-layer system is internally reinforced with ceramic and titanium. It is the most durable non-stick system available today. It is tougher than any other non-stick system period! Approved for use with metal utensils. Cooks without any fats, oils or grease. Burned on messes wipe clean with just a paper towel! Tri-riveted, nickel-plated steel handles are completely ovenproof and dishwasher safe. You are not just getting stovetop cookware, it is bake ware as well! Comes with a full 25 year warranty. 2 Qt Sauce Pan w/Cover for soups, sauces, gravies, etc. 3 Qt. Sauce Pan w/Cover for rice, steamed vegetables, hot cereals, etc. 8 Qt. Stock Pot w/Cover is great for chili, spaghetti, corn on the cob pasta, etc. Use it in the oven for pot roast and roast chicken (most sets come only with a 5 Qt. Dutch Oven - this is a giant 8 Qt. Stock Pot)! 10" Highsided Fry Pan - all purpose fry pan, great for chicken, fish, casseroles, eggs/omelets and just about everything else. Remember it's completely safe to use in the oven for such items as pizza, cornbread, deep dish deserts, etc. The cover for the 8 Qt. Stock Pot also fits the 10" Highsided Fry Pan. only $799.99 Comes with a compleat set of cool grips a $20.00 Value FREE !